Very sore today. I’ve been going full steam trying to get the Z back on the road before this Thursday, since it’s my son’s last day of 1st grade and I promised him I’d drive him to school in it. The upshot is that after spending most of the last month “topside,” getting the engine running, these past few weeks have seen me mostly under the car, up to my elbows in dirty, cramped brake, clutch and driveline work. These are all the parts that had to come off for me to be able replace the cover gasket on the diff. 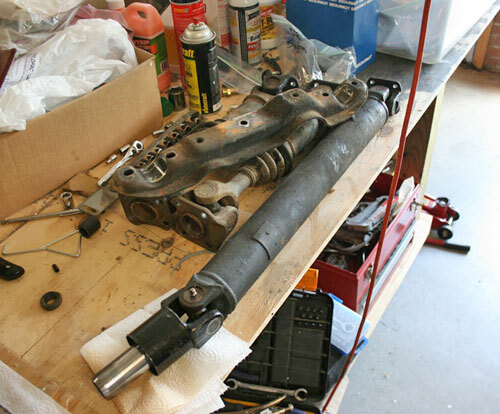 The axle shafts in particular were a bear to remove. 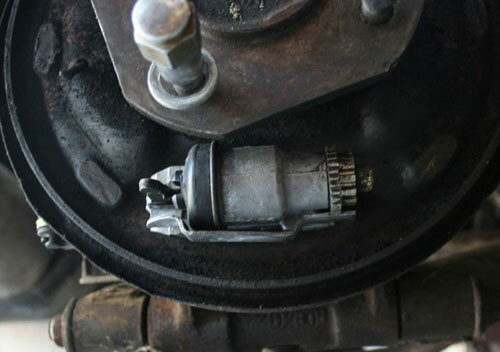 More modern CV joints and circlips make life much easier. 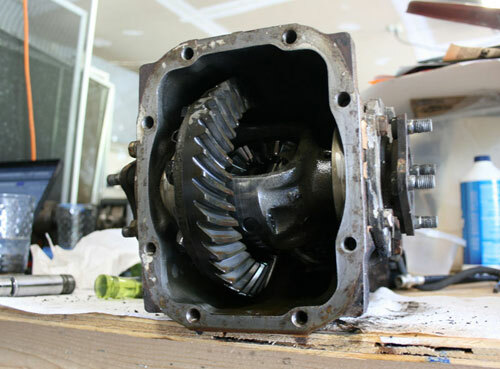 The internals of the diff looked relatively unscathed after 40 years. However, to my recollection, there is a pronounced whine from the diff whilst driving, something that will be looked into further during the full restoration phase. Interesting find: There is a (apparently non-OEM) baffle for the diff breather sandwiched in between two cover gaskets. It was a bit annoying to have to order another gasket, but I’m glad it’s there. 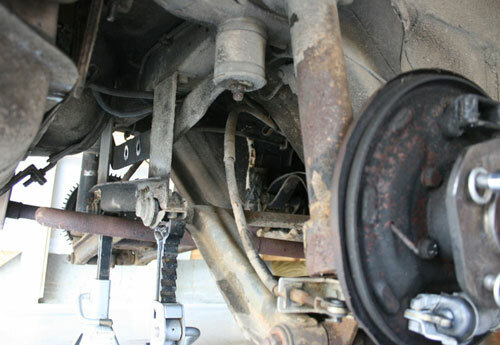 I despise drum brakes. Yes, I’ve heard all the arguments for how a disc conversion is expensive, and that my braking performance will likely actually decrease slightly, but to not have to deal with pulling off drums that are fused to the hub, or rebuild ornery wheel cylinders… I would pay quite a bit. And of course, there’s also the fact that discs just look better. With any luck, I’ll have it on the road for a test drive tonight. Just need to bleed the clutch and brake systems and we’ll be good to go. Video (hopefully) forthcoming. Update: (9:05 PM) The required brake bridge didn’t come in tonight, as promised. Frustrating. Won’t have a whole evening to tune it before Thursday, but…I’ll make the best of it. Disappointing. Thank you for sharing these great articles. I’m looking for some help in finding spare parts for my father’s 240Z. Could you please get in touch with me via email for sharing some tips?